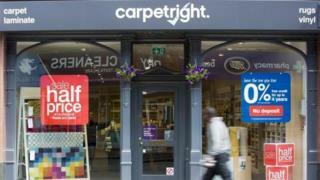 Carpetright says it is closing 92 stores and cutting 300 jobs as part of a restructuring plan. The retailer recently started talks with lenders to ensure it does not breach the terms of its bank loans. The chain is planning a company voluntary arrangement (CVA) that will allow it to shut the worst-performing stores and ask for rent concessions on another 113 sites. It is the latest in a long list of businesses to run into trouble. Retailers are being pummelled as fewer people are moving home, which means lower demand for new flooring. Consumers are also having to tighten their belts as inflation has outstripped wage growth. Many retailers are also struggling to adjust to the shift from in-store shopping to buying goods online. Is your Carpetright store closing? Carpetright, which has more than 400 UK shops, has been struggling with underperforming outlets which have made its rental costs harder to shoulder. There have been similar, recent CVA arrangements at fashion retailer New Look and restaurant chains Jamie's Italian, Prezzo and Byron. The plight of Carpetright is not only a story of the struggling High Street, but also a tale of what is going on in the streets and avenues nearby. The BBC recently revealed that homeowners are moving house half as often as they did before the financial crisis. Now, figures from surveyors have shown 12 consecutive months of falling demand from property buyers, with little sign of a turnaround. So, with fewer people moving in to a new place, there is less demand for new fittings such as carpets and curtains. The squeeze on household finances means many of those staying put are delaying their plans to redecorate. That is why the furniture store sales seem never to end, and why this sector is trying to find new ways to attract customers. As part of its announcement on Thursday, it also said it had identified a "technical breach" in its borrowing agreement. The company said it would raise £60m through a placing of new shares, which would raise money to cut debt and pay for the restructuring plan. After initially falling by almost a quarter, shares in Carpetright were down 4.4% at 40.1p in morning trading. The CVA needs approval from creditors, which it will seek at a meeting on 26 April, and it will then hold a meeting with shareholders to ask for their approval on 30 April. The company gave a profit warning at the beginning of March. It added that trading conditions had remained difficult since then, but that it still expected to make only a small underlying pre-tax loss for the year. Wilf Walsh, Carpetright chief executive, said: "These tough but necessary actions will enable us to address the burden of a legacy UK property estate consisting of too many poorly located stores on unsustainable rents and are essential if we are to restore our profitability and deliver a successful turnaround." Mothercare said its sales had fallen despite a rise in online sales. The retailer reported like-for-like sales fell 2.8% in the last 12 weeks owing to decreased consumer footfall. Soft furnishings and homewares group Dunelm said its same-store sales rose 1.2% in the third quarter, sending its shares up 6% on the back of this rare piece of positive retail news. And WH Smith said its profits fell 1% but it hailed a "good start" to the second half of the financial year, and is confident about the full year. Do you work for Carpetright? Will your store be affected? Share your views and experiences by emailing haveyoursay@bbc.co.uk.